Additionally, GameSpot played a live demo of Beyond Good and Evil 2. They talked about the mechanics that are in the game and how they worked. Alongside commanding a crew of space pirates, you will have an array of weapons and gadgets at your disposal. These include a melee weapon, a firearm, an energy shield, and a jetpack. There are also augmentations for each variant. Some of these augmentations include things such as repulsing abilities, a dome that slows time, a healing factor, and damage boosting mods. Along with massive worlds to traverse, players will also seek things out at an extraterrestrial level. To help navigate, a high-tech spyglass is used to help sort things out in each world. The spyglass is used to inform the player of specific locations and enemies. The use of the spyglass was hinted to be a critical feature in the game because enemies can surprise you with an array of abilities much similar or different than your own. The spyglass will give you a rundown of what kind of power they have prior to any engagements. Throughout the behind the scenes gameplay, GameSpot test-runners took part in a raid on a scientific facility that specializes in the hybridization of monkeys. After a combat scenario utilizing the spyglass, they found a surviving test subject, allowing the player to recruit the character to their cause. As the test-runners continued, spaceship customization and dogfighting were both touched upon. With the ship, players swap out things such as wings, cabins, thrusters and much more. Cosmetically, you can submit your own artwork design to be used in-game through the services of Hitrecord. Hitrecord is also used for designing your own billboards that are available for purchase throughout the game. Dogfighting took on a style that was fast-paced and very arcade-like, complete with barrel rolls and loops to get behind enemy fighters. The weapon systems on the ships can be modified using augmentation like the ones mentioned previously. Flying through the sky, players can decide to take their ships upwards, causing a seamless transition into space as the cities and planets shrink in the distance while you rush towards the stars. 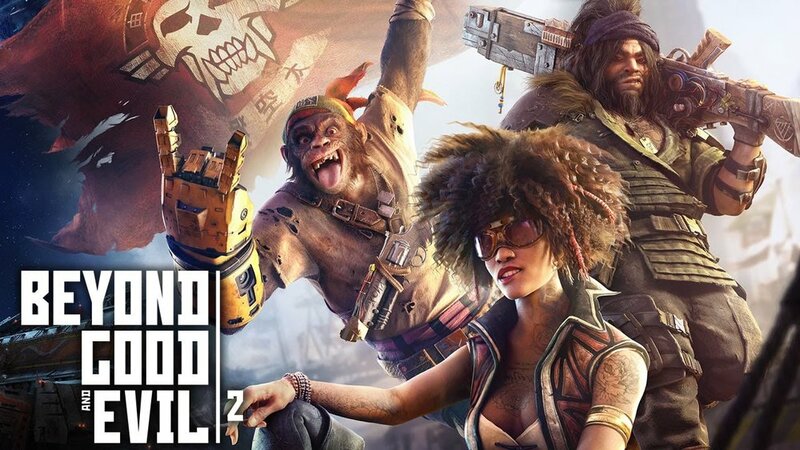 Beyond Good and Evil 2 has no official release date, but a playable beta is planned for later next year.